A five-minute picking round first thing in the morning; about as local as it gets. One of the women I work with asked me the other day, “So since you have this big garden and everything, what do you eat?” I figured “Pretty much everything” probably wasn’t the answer she was looking for. Just because I try to grow a lot of our food doesn’t mean we eat weird stuff. To me, weird stuff is Hamburger Helper, Rice-a-Roni, Spaghetti-Os and bottled salad dressing. So OK, what do we eat? We eat meat. 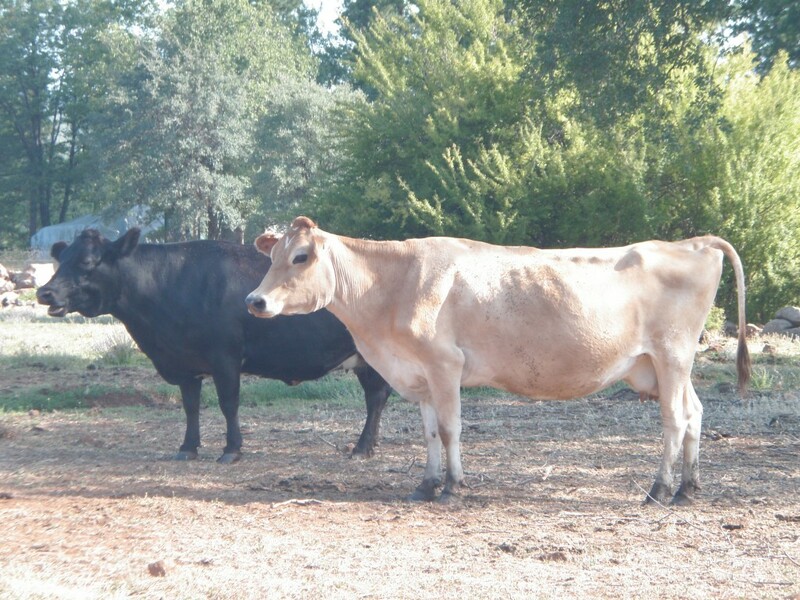 Although we will buy bacon when we don’t have pigs, most of our meat is grown on the ranch. 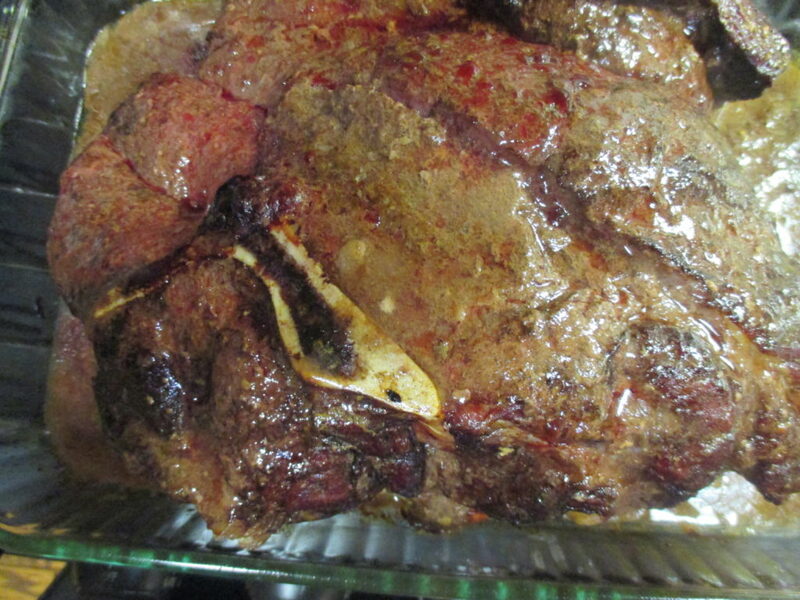 At the moment I have home-grown beef and chicken in the freezer (and a nice big chuck roast in the oven). Right now we also have lots of venison and elk from hubby’s hunting trip earlier this year. Other wild meats such as goose and duck are also in the freezer at the moment. No lamb at the moment – need to get a new sheep house built that is cougar-proof before we try to raise more woollies. We eat eggs. 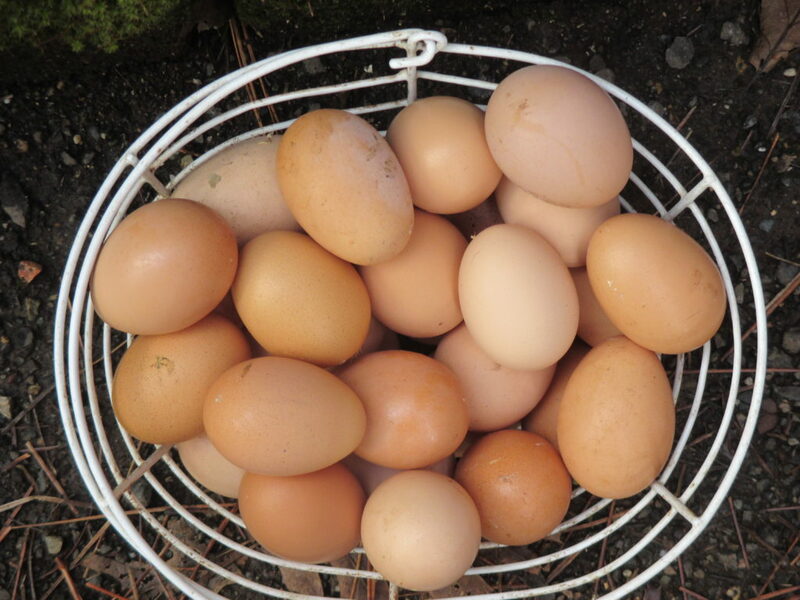 Now that we’re past the winter solstice the chickens are picking up the egg-laying pace again, so most of the time I have four or five dozen eggs in the fridge. 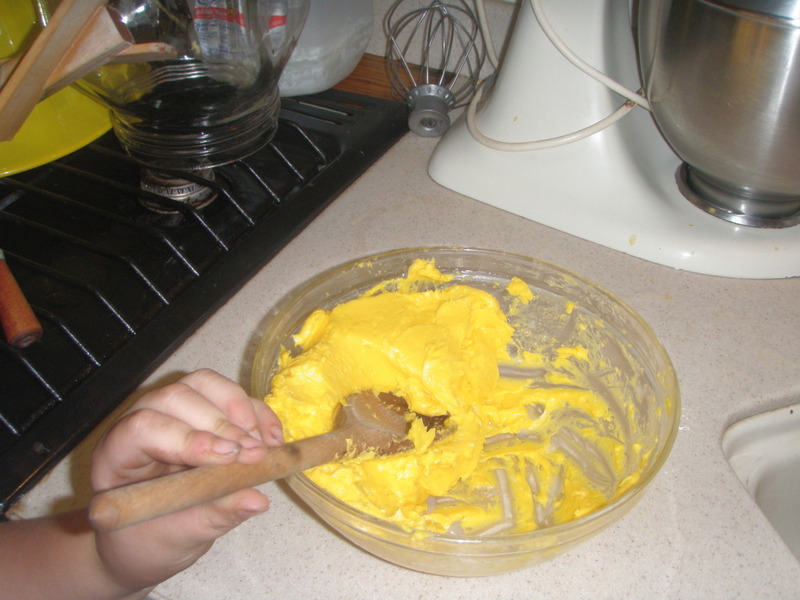 The good stuff – working water out of freshly churned raw butter. We eat fat. Yeah, I know, not politically correct. We use lard, tallow, coconut oil and olive oil. When possible, I buy olive oil from the local orchard. It shows up in the fall at the health food store in the big town (and goes really fast!). And we eat butter and cream cheese, especially when we have a milk cow and it’s home-made. We eat fruit. We have so many fruit trees on the place (not to mention the wild blackberries) that as long as we pick and preserve in some fashion we will never run short of fruit. Apples, pears, plums (plus wild plums), cherries, an Asian pear, elderberries and grapes grow all over the ranch. Some were deliberately planted, while others were obviously dropped by birds or tossed by a ranch hand who took one in a lunch bucket. I think I’m going to have to break down and buy a new Meyer lemon tree, though. The current tree is elderly and I’m pretty sure it’s on its last legs – err, trunk. 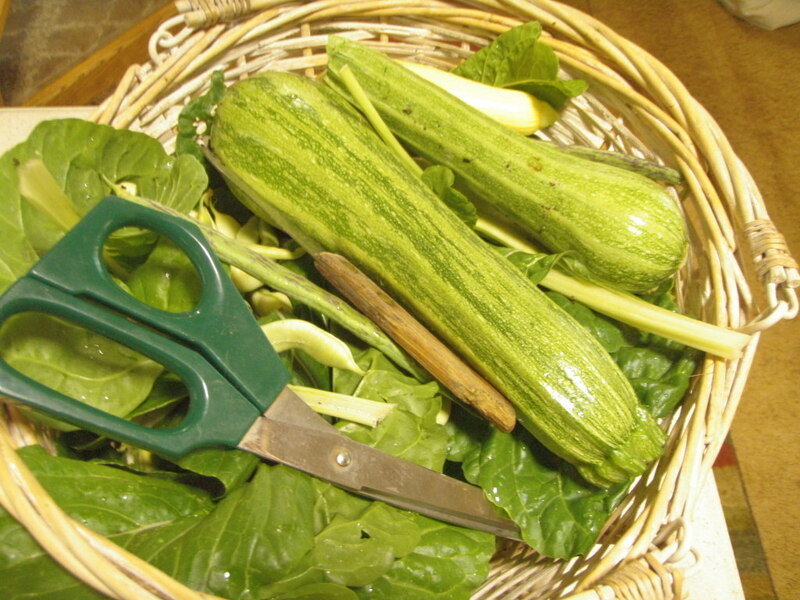 Summer squash: Black Zucchini, Early Prolific Straightneck, Cocozelle, Yellow Patty Pan and a few Crystal Apple cucumbers. We eat veggies. In our climate, I can grow darn near anything. My plantings are limited only by space, water and the food dislikes of family members. For example, I’m the only one who eats beets, but everybody eats summer squash, tomatoes and corn. 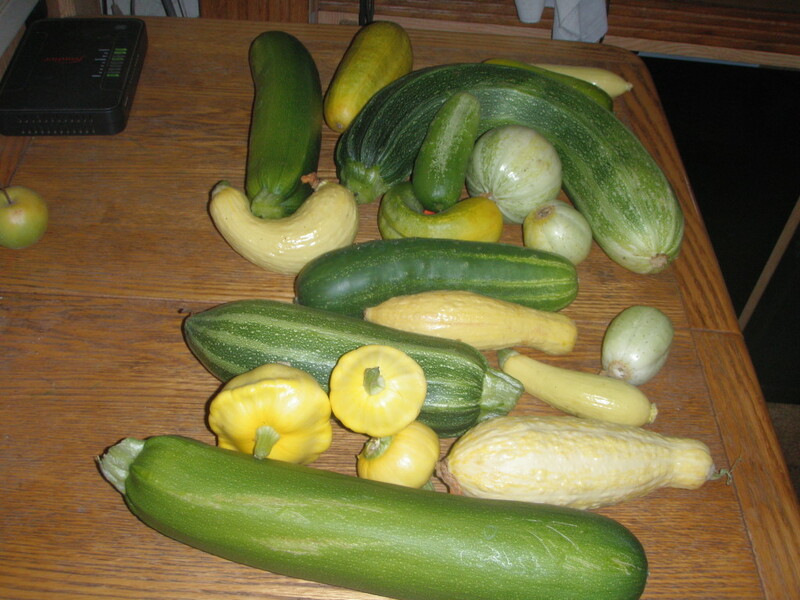 Good thing about that summer squash, since if there’s a sure thing in the garden surplus department, summer squash would be IT. When they were little, the kids always wanted “Maybelle” milk – not the store-bought stuff. We drink milk. Right now, hubby’s drinking the store-bought stuff (which I won’t touch) because he has to have milk in some form. Since Violet’s not going to work out as a family cow, I’m on the lookout for a new milk cow. He also drinks tea and we both drink coffee. What don’t we eat? Well, I eat very little grain and when I do, it’s not wheat – hubby likes French toast or a sandwich occasionally. Although I buy sugar, the hummingbirds are the primary beneficiaries of the white stuff. I bake a pie or cake about three times a year. I haven’t had any luck with preserving olives, so I do buy those. And occasionally we’ll buy a pizza at my daughter’s store or something like potato chips. I don’t buy canned veggies or prepared foods or fruit (except peaches – the peach trees are still young-uns) or baked goods. 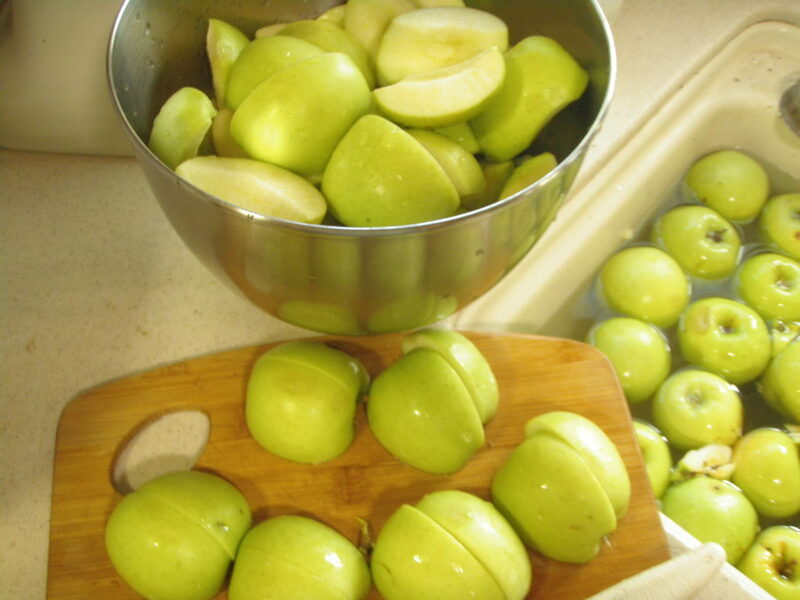 This entry was posted in Food, Health and tagged diet, eat, fat, fruit, grain, meat, sugar. Bookmark the permalink.